OTTAWA - Tough penalties for elections-official impersonators, beefier investigative powers and more voter privacy were among the ideas floated Wednesday in a long-awaited Elections Canada report in the wake of the robocalls affair. While the report does not shed light on the identity of the mysterious figure known as "Pierre Poutine," the person behind a rash of misleading calls in ridings across the country, it does offer a number of suggestions aimed at preventing a similar episode in future election campaigns. The report urges the government to create a new Elections Act offence that includes hefty fines of up to $250,000 and five years in jail for anyone caught pretending to represent Elections Canada. "Elections Canada is of the view that many offences under the act should provide for higher sanctions than is currently the case, in order to have a more significant deterrent effect on offenders," the report says. "Higher fines would send a message to all Canadians about the importance given by Parliament to maintaining the integrity of the electoral process." It also calls for greater powers to compel witnesses to testify and produce documents to investigators. One of the problems Elections Canada encountered during its probe of robocalls in Guelph, Ont., was that at least three people were unwilling to speak to investigators. "The inability to compel testimony has been one of the most significant obstacles to effective enforcement of the act," the report says. Political parties should also have to produce any documents requested by the chief electoral officer, the report adds. As well, it suggests that telemarketers should by law have to keep records for at least a year of all calls made in Canada during an election, including client and payment information, scripts, incoming and outgoing calls and phone numbers displayed to voters. The report further calls for either a voluntary or mandatory code of conduct for political parties, better safeguards for voters' personal information and special rules for dealing with elderly voters. Elections Canada also said it needs to do a better job of telling voters when polling sites are changed very late in an election period. Conservative MP Tim Uppal, the minister of state for democratic reform, said the government would consider Elections Canada's recommendations. "As previously indicated, we are looking at reforms to Canada's election laws," his spokeswoman wrote on his behalf in an emailed statement. "We will consider these suggestions as we prepare to put forward a comprehensive elections reform proposal." New Democrat MP Craig Scott, the party's critic for democratic reform, accused the government of dragging its feet on new legislation to prevent false or misleading robocalls. "Hopefully it's going to give the government the kick that they need," Scott said of the report. "They're six months overdue when they're supposed to table their own legislation. If they don't have something sitting ready, assisted by this, to be tabled in April, we really know they're not serious." The report comes amid an ongoing Elections Canada investigation into fraudulent robocalls, stemming from complaints that have surfaced in dozens of ridings across the country. The agency's investigation has centred on the southwestern Ontario riding of Guelph, where a number of residents say they received automated phone calls from someone claiming to be from Elections Canada and directing them to a wrong or non-existent polling station. 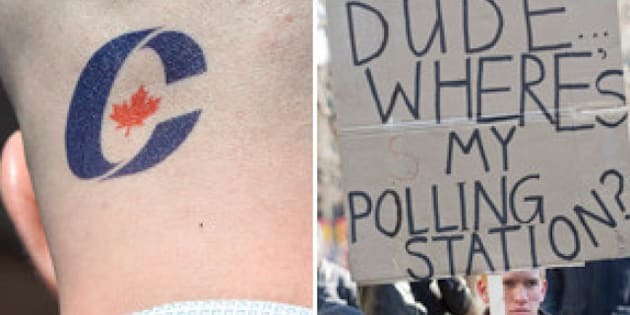 While the misleading phone calls appeared to target non-Conservative voters, the Conservative party insists it had no involvement in any such scheme and says it is assisting the investigation.